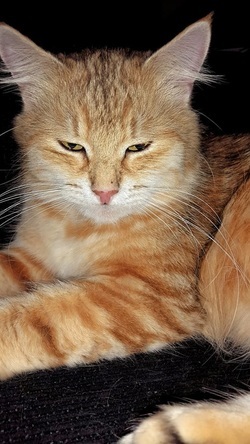 Imported from Saratov from a famous Russian cattery Voljskaya Krasa that specializes in golden Siberian cats. Pika arrived in Canada at 3 months. She is a wonderful blue golden with glowing green eyes. Her coat shines and is so soft it begs you to touch it. There is nothing like the coat of a purebred golden Siberian cat as it shines in the sunlight. She is an absolutely stunning creature. Pika's litters have been goldens with dark striping, browns and a blue golden or bimetallic here and there.